First and foremost, understand that it is the engineer, and not the gear that makes the music sound great. Four Legs Records Engineer Steven J Goldman is capable of taking even mediocre recordings done elsewhere and mixing/mastering them to sound like they were meant to. He can even make them sound almost exactly like any reference recording you can throw at him, modern or vintage. That being said, a great recording is always better with great technique and gear. The gear and mics used here at Four Legs Records are powerful, quality pieces - specifically suited to the work they are used on. And the technique employed, especially in mixing, is at a level beyond that of most studios and engineers. You can come to Four Legs Records, and expect results rarely found outside of world-class facilities. 5J Barrow recording all at the same time in the live space. Photo courtesy Eryn Murman. 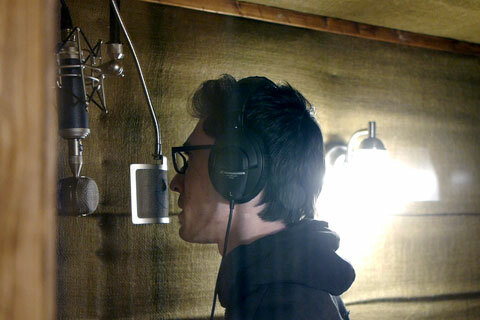 Dominick John laying down a track in the vocal booth. 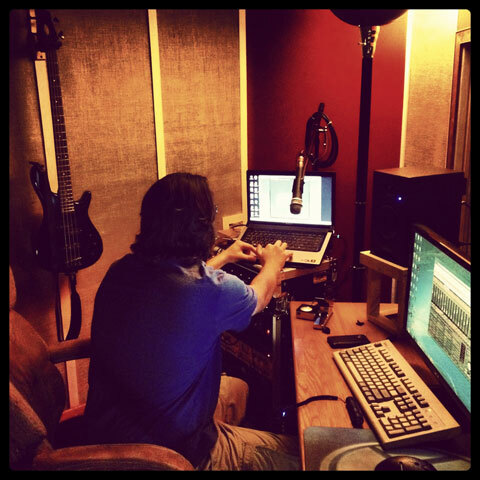 Four Legs Records records, edits, mixes, and masters using SONAR X1D on a custom PC-based studio setup. We use 24 Black Lion Audio boutique-modified preamps with pristine A/D conversion and a world-class master clock for superb clarity; including two Focusrite Liquid preamps capable of faithfully reproducing the sound of ten of the most sought-after preamps used today. We are a proud user of only the most accurate models of the major industry-standard analog signal processors by Slate Digital, Waves, and Native Instruments. Every step of the way, our recordings are treated as if in a true analog environment; printed to magnetic tape and mixed/mastered on Neve, SSL and API consoles from within the digital environment. Along with the analog mojo, our tracks also benefit from the unrivaled flexibility and precision of some of the most powerful digital editing and sculpting tools around. And in the digital environment, these analog processors can be used and routed in ways that physical units can not. The studio layout currently consists of the treated master control/mixing room, the live space with treated drum/guitar alcove and seating, the treated vocal/instrumental isolation booth, and the ventilated guitar/bass amp isolation chamber. 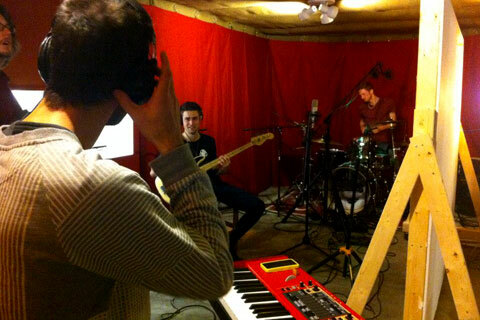 We can record up to 24 tracks of audio simultaneously, with up to 6 performers. This means a band could track all of their instruments at the same time, or go for a more precise recording by performing one at a time. If for some reason you can't come to us to record your band, we can come to you to track, and make just about any room into a studio-on-the-road, with high-quality results. Major-label sound in any room at a low price. If you cannot work with us in-person to complete a project, (everybody has some form of a busy schedule) we are well-experienced in remote mixing. For those who are unable to watch our live internet stream, we will put out a first mix on our own, and we will communicate with you on what needs changing. If you choose to go with our flat rates, you are given a number of included mixes, which is usually more than enough to adress any issues and put out a great master product. For those of you with a decent internet connection, we can live-stream our mixes online, allowing you to not only listen to the tracks being edited/mixed, but also to communicate with us and give feedback nearly in real-time. Our streaming site at Twitch.tv is where you can go to watch the broadcast, as well as chat with us or check out a few older archived broadcasts. Everything you hear is direct out of the main board, in clear, high-quality stereo. 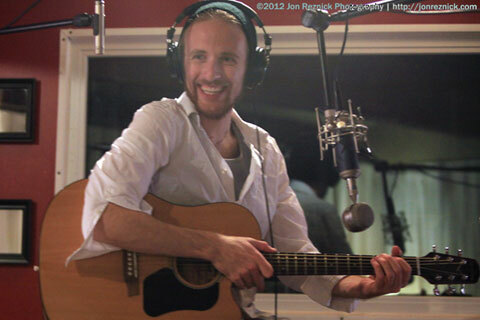 Hard Soul's John Salka in between acoustic guitar takes. In order to achieve a high-quality near-analog sound in a digital format, we have invested in processors from the likes of Slate Digital, Waves, EastWest, Softube and Native Instruments. Our Slate Digital collection gives us the ability to exactly model the non-linear sound that the big popular, high-priced consoles and mastering compressors (SSL 4000, Neve, Trident, API etc.) impart upon their individual channels and mixbusses. We record on our already great-sounding gear, and make it sound like it was tracked on a monster console. With Slate Digital, we are also able to greatly refine or trigger-in new drum tones from the number one professionally-used drum library; and we are able to use a brand new mastering algorithm that completely removes that "squashed" feeling from completed tracks, while still being able to compete with high industry volume levels. Drum transients stay as punchy as you want them to, even in a dense, loud master. Our Waves collection is a series of bundles that gives us the ability to accomplish a wide range of things. We have access to the great-sounding EQ/channel strips from several classic SSL, Neve, and API consoles. We have access to the legendary sound of the LA-2A, LA-3A and Urei 1176 (both black and blue-stripe) compressors; widely considered the best vocal compressors ever made, as well as the sounds of a number of mainstream reverbs, including the Lexicon 480/300/224, the Sony DPS-V77, and the powerful convolution technology of the Waves IR-1. We have access to a huge variety of industry-standard Diamond processors that handle anything from de-essing, to harmonic enhancement, to extreme audio restoration and beyond. Our Waves and Native Instruments processors give us access to a huge variety of convincing classic and modern guitar and bass tones, to supplement what we can do with just live-miking. For synth pads and lively enhancements, our Native Instruments processors also offer a virtual string section, a vocally-controlled synthesizer, and a deep frequency mutator. Pianists will be delighted at the sound of our Ivory II American Concert D Grand Piano - a 50GB library of meticulous samples taken from a million-dollar Steinway. Our EastWest library is a massive collection of the most stunningly realistic orchestral strings, brass and woodwinds on the market today, as well as exotic instruments from the Far East, cinematic scoring percussion, a number of full choirs, and grungy electronic leads. Electronic artists will feel at home with the use of our synthesizers, including the likes of Dimension Pro, Rapture, Z3ta+ and more. We can also produce percussion tracks practically indistinguishable from live-mic tracks using our Steven Slate Drums and Session Drummer programs. We use Melodyne to handle all vocal pitch correction, from light/transparent to heavy-handed and robotic. Our Softube processors include the TLA-100 Tube Leveling Amplifier, a faithfully-reproduced analog unit capable of imparting life and clarity upon any signal; and the TSAR-1 True Stereo Algorithmic Reverb, a powerful reverb that can be tweaked to put out nearly any type of reverb sound in a convincing fashion. The list of software processors available to us is always growing, and we may have missed a few things. If there's one thing to take away from this list, it's that your recording will sound like it came out a major-label studio. We don't just have a bunch of gear models - we actually know how to use them. Four Legs Records uses a variety of quality commercial and custom-made microphones for various tracking purposes. When recording a lead vocal, we usually pick one of four microphones; the Shure SM7B, the Michael Joly Engineering hand-modified NT2A, the Fox Audio Research m251, and the Fox Audio Research 47 Custom. We proudly use the Shure SM7B, a recording and broadcast legend whose use caught on quickly once word got out that Michael Jackson's "Thriller" album was mainly recorded using it. It can tame harsh sibilance, and put an aggressive vocal right in-your-face. It also is one of the two de facto dynamic voice over standards in professional audio today. The Michael Joly Engineering modded NT2A used to be a good microphone by Rode. With electronics/circuit upgrades, new mesh, and a brand new handmade K47 capsule, this mic is now practically indistinguishable in tone (google it) from the Neumann U87 - the industry's most popular high-end microphone. It doesn't alter the tone of a source like other microphones; it just sounds better. We've used this on everything from acoustic guitar, to drums, guitar cabs, violins and more. It just sounds great on everything. In sticking with the theme of handmade, independent designers' models of classic gear, the third go-to vocal/instrument mic of choice at FLR is the Fox Audio Research m251. If you recognize the number 251, then you know what this mic sounds like. If not, this mic is bright but never harsh, accurate but full of tube-warmed goodness. The original Telefunken ELAM 251 was designed as a replacement for the U47, and became reknown for its unmatched high-end sweetness. The FAR m251 is a faithful recreation of this design with a circuit designed by Brian Fox, and capsule by Tim Campbell. Also handmade by Brian fox is our fourth go-to vocal/instrument mic, the Fox Audio Research 47 Custom. This is the most sonically accurate replica of the original Neumann U47 possible. The original Neumann U47 was discontinued long ago, but has always been fabled as the greatest microphone of all time. It has a detailed, accurate full-frequency response, with a warmth and sweetness that makes it perfect on nearly every source. Also designed by Brian Fox, with a capsule by John Peluso. On to the other mics! We just ordered several pairs of Heil PR30 and PR31 large diaphragm dynamic microphones, and were so floored by their sound on everything from drums to guitars, that we stopped using our large diaphragm condensers on anything but vocals and room mics! You have to hear them to believe them. The response is similar to a ribbon microphone with a flattering presence boost at critical clarity frequencies. We use the industry standard AKG C451 to capture both intimate acoustic guitar performances and percussion with powerful transients; e.g. hi-hats and snare drums. We also employ a pair of Oktava MK-012s on hi-hats and other cymbals. Our selection of dynamic microphones is well-suited to tracking live drums and amplifiers. We carry several Shure SM57's, the iconic guitar amp and snare drum mic. We use the Electro-Voice N/D868 to capture the power and punch of the kick drum without the "eq'd" sound of many popular kick drum mics. We use an ever-growing number of Heil PR30's to close-mic toms, cymbals, guitar cabs, and to record drum overheads to amazing results. They're the only mics out there that can compete with the original, vintage Sennheiser MD421U5's on a variety of sources.Other mics we have on hand include the Sennheiser e906 and 609 (Guitar cabs/Drums) and the Audix D2 (Toms), but lately the PR30's are boldly booting every other microphone out of their coveted slots. Finally, we have a number of extra pieces of equipment that expand our sonic capabilities. We have the Orange Dark Terror guitar head, a boutique low-wattage high-gain amplifier with expressive tone controls that drastically change its voicing. We have a Symetrix 528e vocal processor unit that shines on in-your-face vocal leads, especially spoken word. We have multiple fully-analog guitar preamps, including the Bogner Ecstasy Red, (everything from rock to metal) Tech 21 Leeds, (Hiwatt amps) and AMT Electronics P2 and R2 (Peavey 5150/6505 and Mesa Triple Rectifier). We also have a VOX Tonelab SE modelling processor, as well as a number of hand-modded stompboxes for ultimate guitar tone possibilities. Bass guitars are usually done direct, using Tech 21's Sansamp, and are then enhanced with additional amps/tones in post for powerful low end. We have three guitar cabs on hand as well. The first, a custom VHT 4x12 with both Eminence-designed P50E speakers (think a cross between a Celestion V30 and a Heritage Greenback) and Celestion G12T-75s (straight out of a Marshall 1960 cab). The second cab, an Orange PPC112 fitted with a Celestion Vintage 30 speaker. The third cab, a custom Seismic Audio 1x12 with a single P50E and treated interior (for smooth breakup and extremely tight tone). To drive the cabs, we use an all-tube power amplifier in conjunction with an EHX 44 Magnum power amp and the Orange Dark Terror. Steven J Goldman setting up a stream from the control room. Photo courtesy John Salka.